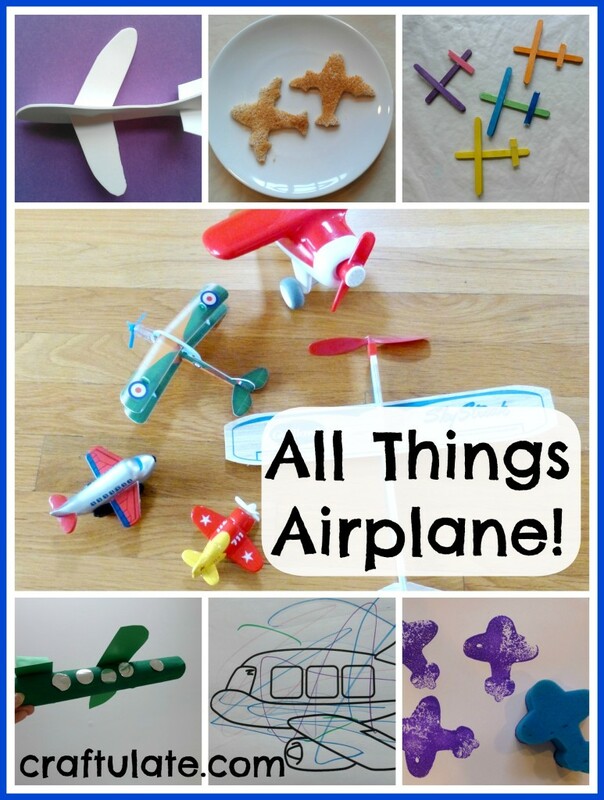 All Things Airplane includes art, crafts, activities, books and more that all feature airplanes! We’ve just finished “all things airplane week” and we’ve had such fun! F is always pointing out airplanes – often he can see AND hear them before anyone else. So this theme was perfect for him. Making our own airplane was essential for this week – so in the end we made three types! 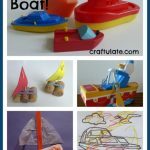 The first was using coloured craft sticks. We glued two together to make a fuselage (although more would be even better). Then we glued two more sticks together to make wings. Then I broke the ends off a stick to make the tail fin. This left some slightly raw edges which I later went back and filed down. 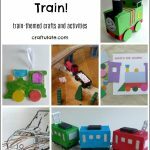 Of course, if you are planning this craft more than 30 seconds in advance then you could do this before you start! 😉 Then we glued the wings and tail to the fuselage. In the end we made several of these as they were so quick and easy – with F calling out the colours he wanted. 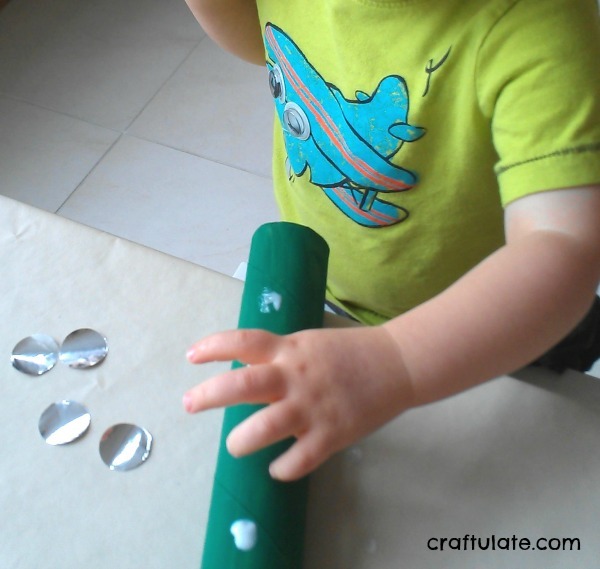 Our second type of homemade airplane used kitchen paper tubes, inspired by the book Cars, Trains and Planes. I cut out pieces of cardstock for the tail fin and the wings. I used a 1″ paper cutter to cut out circles of silver paper for the windows. After the paint was dry, we glued on the windows, tail and wings. F investigated the finished plane and evidently decided it was a cargo plane, because he loaded some of his cars inside the tube! For our last type of homemade airplane I cut out shapes from some white craft foam. It made a fairly good plane but I thought it should be heavier. After washing the container (it hadn’t been in contact with meat) I cut the airplane shapes out from the styrofoam and constructed the plane. I gave F some stickers to decorate both foam planes and he only wanted to use the ladybug stickers. We tried flying the “bug plane” inside and then took it outside. It didn’t fly particularly well (my husband says it needed more weight on the nose) but it didn’t matter to us! Using an airplane-shaped sponge we made some prints. This comes naturally to F whenever we are outside. Or by a window. Or in a car. We can often see three at one time when playing at the water table on our deck. I made some airplane-shaped toast for F this week! 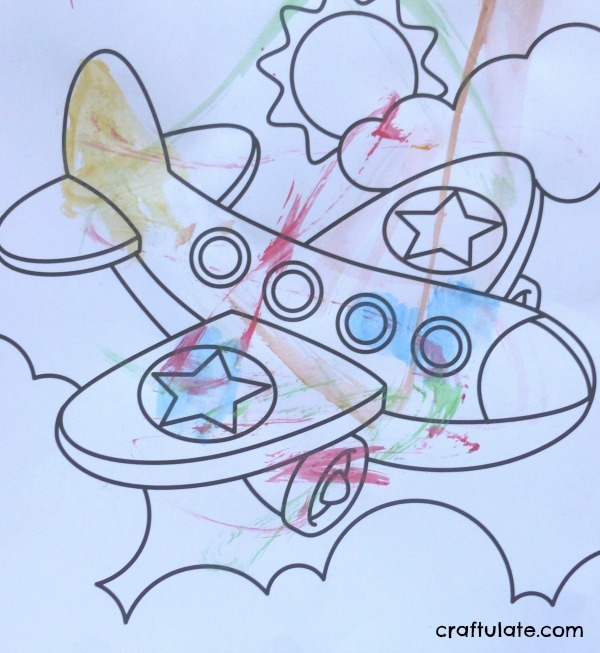 I printed some airplane pictures for F to colour from DLTK. 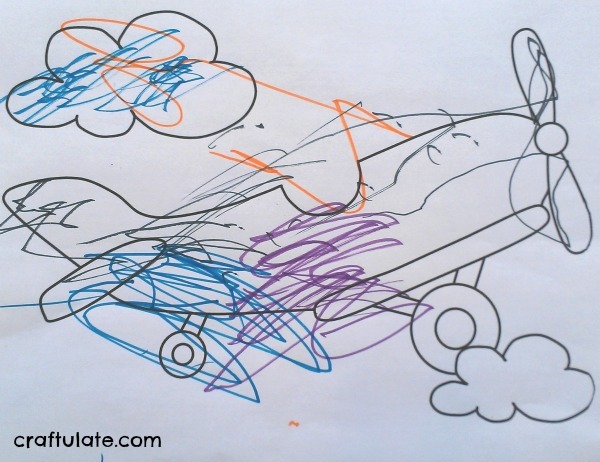 Note: Sorry if these just look like scribbles – but I am definitely starting to see signs that he is contemplating colouring within the lines! We also tried out a page from our Melissa & Doug Paint with Water book. This is a really simple app that just shows photos of different planes with accompanying noises. It’s free but it didn’t impress me that the noise didn’t match the plane type. The free version of this doesn’t have any plane puzzles, they are in the upgrade that currently costs $1.99. My son finds the first four puzzles in the free version pretty easy, so we may upgrade at some point. We’ve had this app for over six months and it is still a favourite. It features a wide range of games with different modes of transport. It also has cute music and is great value! We have quite a few airplane books! Here are our favourites. This was F’s first Barton book and it is so well loved that it has had to be repaired many times! Very simple, with eye-catching illustrations and straight-forward text. I bought this for a recent transatlantic flight and other than being bigger than I imagined, it was perfect for F. Nice story, lots of “lift the flap” action, and bright illustrations (although not very accurate, according to my husband). We are just getting into this book right now. The pages are crammed full of busy pictures, text, and labels. So much to find! I am such a huge fan of this series of books; the words and rhymes flow so nicely. I also love how safety issues and an explanation of how planes can fly are worked seamlessly into the story. Not really a book as such, but it is super cheap from Amazon right now and I added it to my cart one day. It has 30 reusable stickers so that you can create an airport scene. Simple but easy to pack! We have travelled transatlantic with F on five return trips – all in the first two years of his life! It definitely hasn’t been easy, especially the time I had to take him on my own. He doesn’t sleep very much (the flight is 7-9 hours) and he is more than a little reluctant to be strapped in. But we are finding it slightly easier as he gets older. He can watch the TV, but can’t listen to it as he won’t wear headphones. His love of the Kindle has been quite a help, so I always make sure it is fully charged and has his latest apps on it. The photo on the right is on an internal flight within the UK – he’d just turned two and they wouldn’t let me take his car seat on board! I also make sure I am absolutely laden down with snacks, as that seems to be more needed than a range of toys. I take a few books and recently some magnetic games. We also need activities while waiting for the flight, this is F playing with his Face Parts Game in the airport lounge. On our last flight (within the US) he totally understood that the stuffy vibrating room full of seats he had to sit in for hours was actually an airplane. So that really helped. By the time we fly with him again I think he’ll be even better – especially after this airplane-themed week! AND this time I think we’ll get him his own wheelie case – so he can drag around his own stuff! 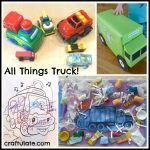 We have now started a whole transportation series! Check out the other vehicles that we have featured! How old was your son when you tried this? 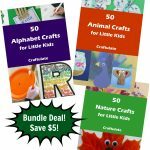 Those activities look great – I love the hula hoop plane school! Thanks for the link. I think you just needed to add a penny to the nose of the plane to make it fly better! Thanks Noreen – I remembered the penny thing afterwards! These ideas look so fun. I am officially inspired and want to do a plane week with my kids. Thanks for the ideas!